Canadian Pacific's second Empress of Japan was launched in December 1929 at Fairfield Shipbuilding & Engineering, Glasgow. Although built for the line's Pacific Ocean service, her maiden voyage, which began on 14 June 1930, took her from Liverpool to Québec to Southampton. On 12 July, she left Southampton for Hong Kong via Suez, and began her regular transpacific sailings, Hong Kong to Yokohama to Vancouver, on 7 August. 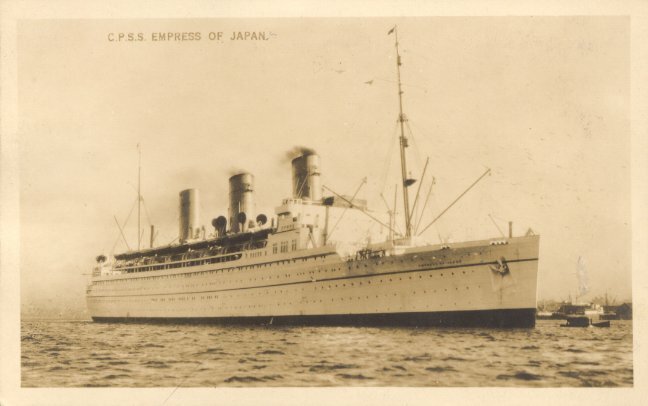 In November 1939, Empress of Japan was requisitioned for service as a troop carrier, and in October 1942, ten months after the attack on Pearl Harbor, her name was changed to Empress of Scotland. Her trooping duties ended in May 1948, and the ship was then refitted for North Atlantic service. She made her first sailing on that service 9 May 1950, on a Liverpool-Greenock-Québec route, which was extended to Montréal in 1952 after the St. Lawrence was dredged to a sufficient draft to accommodate her and her masts were shortened to accommodate the Québec Bridge. In winter, she was used for New York-West Indies cruises. At the end of the 1957 season, Empress of Scotland was laid up at Liverpool and then drydocked at Belfast. The next January she was sold to the Hamburg Atlantic Line and sailed from Belfast to Hamburg under the name Scotland. Rebuilt at Hamburg, she emerged with only two funnels and a new name, Hanseatic. Managed by Hamburg American, she began her new Cuxhaven-New York service on 21 July 1958, and was still used for cruising in the winter. Hanseatic's career was ended by an engine room fire in New York on 7 September 1966. She was towed back to Hamburg, where she was declared a total loss and sold for scrapping.